Hey girl, thank you for your sweet comment on my blog. You look fabulous! Love your style! GIVEAWAY on my blog. Stay in touch. I'm following you on Facebook and G, hope you will follow back. Such a vibrant and lovely top! so lovely this top the colour is very nice! Beautiful outfit! Love the neon green shirt & your hair! Džemperak je baš upotpunio kombinaciju! ohmygod. That is one gorgeous top! I love green, but i'm soo fussy about it. Dirty, boring green anyone? eugh. I much prefer bright greens like that...and a studded white collar? I'm in! Love this so much and your blog in general. You have such nice taste in clothing! Lovely blog. Following you now. Would you like to visit me and maybe if you like follow me too? Let me know. You're so pretty! 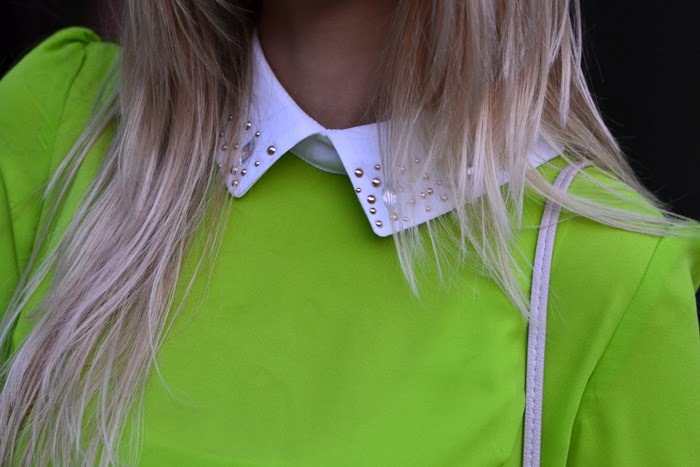 Love your green top :) You have a nice blog, mind to follow each other?